Home / Store / Comics / Modern Age Comics / Thor #337 (1st Simonson c/a & 1st Beta Ray Bill), #338 (2nd Beta Ray Bill) NM, #339 – all NM! Thor #337 (1st Simonson c/a & 1st Beta Ray Bill), #338 (2nd Beta Ray Bill) NM, #339 – all NM! Cover by Walt Simonson. Beta Ray Bill (first appearance) becomes Thor in “Doom!”, script and art by Walt Simonson; Nick Fury asks Thor’s aid in investigating an alien ship heading for earth; Thor arrives and triggers the awakening of an alien protector, Beta Ray Bill; Bill bests Thor and takes up his hammer only to be accidentally summoned to Asgard by Odin who thinks he is summoning Thor. Brief appearances by Nick Fury, Loki, Sif, Balder, Heimdall, Volstagg, and Odin. First appearance of Lorelei (sister of the Enchantress). 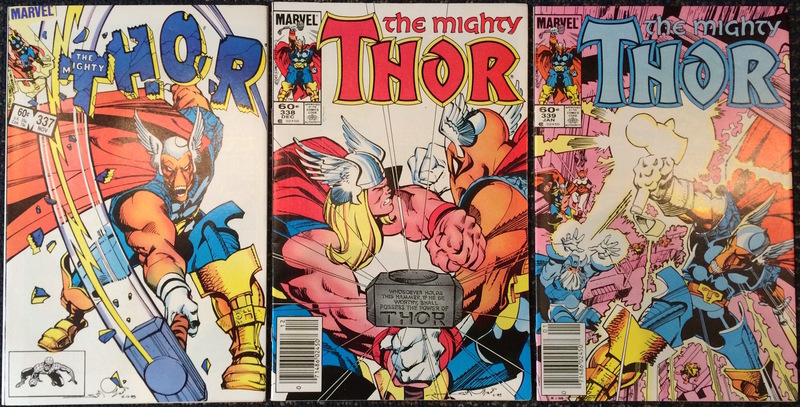 Begins Walt Simonson’s run on Thor (through #382). Bullpen Bulletins. Star Frontiers TSR ad. 36 pgs., full color. $0.60. Cover price $0.60. Cover by Walt Simonson. In Beta Ray Bill’s second appearance, he comes to blows with Thor in “A Fool and His Hammer,” script and art by Walt Simonson; Bill and Thor fight in single combat for the honor of wielding Mjolner and the alien bests the god of thunder. Brief appearances by Nick Fury, Odin, Sif, Loki, Balder, and Volstagg. Bullpen Bulletins. Star Frontiers TSR ad. 36 pgs., full color. $0.60. Cover price $0.60. Cover by Walt Simonson. “Something Old, Something New,” script and art by Walt Simonson; Odin has the dwarves create a hammer for Bill and sends the alien and his son into space to rescue Bill’s people. Appearances by Sif, Odin, and Volstagg. Bullpen Bulletins. Carlin and Simonson’s Page O’ Thor Stuff; Assistant editor’s month shenanigans. Star Frontiers TSR ad. 36 pgs., full color. $0.60. Cover price $0.60. Guardians of the Galaxy #1 (1990 1st Series) NM- First issue in their own series!